Europe is big on holding outdoor Christmas Markets, but Budapest has a very special feel. From hand picked stalls of authentic Hungarian Vendors to the smell of mulled wine and chimney cakes, you just can't come to Budapest during the holidays and not visit a Christmas Market. The square at St. Istvan Basilica has a beautiful display of Christmas flair. From the large Christmas tree in the center of a free ice skating rink for kids under 14, to a beautiful light show projected on the church every half hour. The stalls go for a few blocks and offer various findings like holiday ornaments, leather products, ceramics and more. Enjoy the fun before January 1st. Don't forget to head over to Vörösmarty tér. for the Budapest Christmas Fair. You'll be able to experience some yummy traditional Hungarian cuisines like goulash, langos, and more. There is a light show at 5pm that you don't want to miss. Don't forget to peek around the corner and walk down fashion street to see the illuminations on the buildings and the large displays hanging overhead. For an insider look at these very famous markets, opt to take a tour with Budapest101.com as they offer Christmas Market Private Tours. The tours feature specialty foods (Chimney cakes, etc), drinks (Mulled Wine, Unicum/palinka, sweet Tokaji Aszu wine), craftsmanship and holiday traditions, like who brings the presents to Hungarian Kids. Also learn why Hungarians eat lentils on New Years Eve, and soooooo much more. Tell them I sent you, you won't be sorry! Those are my two favorite Christmas markets in the city. Click here for a complete list of all the Christmas Fairs Budapest has to offer. One of the top ice skating rinks is in the famous Hero Square that sits in front of the Vajdahunyad Castle. The City Park Ice rink is one of the largest rinks in Europe. There is a fee to use the rink, but if you own your own skates that's all you have to pay for. If you need skate rentals, it's just a few bucks extra. They even offer deals for students and seniors. For more information on the tickets, click here. Bar 360 gives a beautiful rooftop view of the Budapest Skyline. This place is packed in the summer, but don't miss out on the winter scene. Transformed during the colder season, the igloos are out to give a more intimate vibe to you and your friends. Head on over to Bar 360 and enjoy their seasonal cocktails and winter food menu. There's nothing better than dipping into a bath on a cold night with the steam rising above the thermal waters. It's just an epic, must do experience. If you're in the mood to enjoy the spa in a party atmosphere, make sure you plan your visit for a late night sparty visit. The next SPArty takes place on December 30th at Széchenyi Bath, while the party series continues in February at Lukács Bath. Visiting Budapest is not complete without bathing in one of its world-famous thermal spring spas. 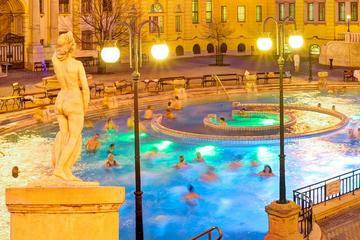 Europe’s largest spa - Szechenyi Bath - with its 18 pools, offers 50 and 70 minutes VIP massages if you’re looking for more than the already amazing comfort brought to you by this prestigious Thermal Spa. During the holidays, some old school street cars take passengers on a festive ride throughout the city. The lit street cars are a great way to get in the holiday cheer by traveling to your destinations with a bit of sparkle. The cars on Line 2 are almost always lit, but you will sometimes see some cars on the 19, 47, 49 and 56A tram lines get in the holiday spirit, as well. For more information on the tram schedule, click here. What are some of your favorite things to do over the holiday season in Budapest?